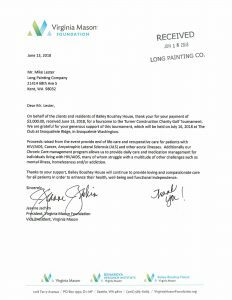 Long Painting Company supports the Turner Construction Charity Golf Tournament by making a donation to the Virginia Mason Bailey-Boushay House. Proceeds raised from the event provide end of life-care and recuperative care for patients with HIV/AIDS, Cancer, Amyotrophic Lateral Sclerosis (ALS) and other acute illnesses. « New Addition to the LPC Accounting Department!